The ElectroMagnetic Induction (EMI) regime is used for the detection and discrimination of buried UneXploded Ordnance (UXO) and Improvised Explosive Devices (IED). The EMI operates at very low frequencies (a few Hertz to a few hundreds of kilo-Hertz) and uses the magnetic field as the primary source of information. It is therefore effectively a magneto-quasi-static regime of the Maxwell's equations. EMI has imposed itself as thetechnique of choice for the discrimination of targets as opposed to their sole detection, which is successfully performed for example using ground penetrating radars. The difference between detection and discrimination is tantamount to the difference between the questions �where is the object� and �what object is it�. The second question, related to discrimination, is significantly more challenging as it attempts to decide whether the perceived signal is due to a UXO or not, despite the impurity of the signal (e.g. jammed by surrounding clutter). dipole model for rapid evaluation of location, orientation, and strength. 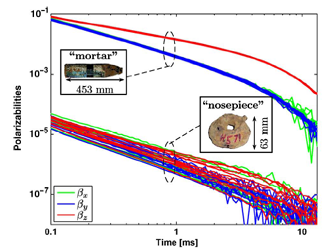 spheroidal mode approach for improved modeling of bodies of revolution (as most UXO are). ellipsoidal mode approach for modeling 3D random objects such as clutter. decision algorithms and stochastic searches such as the support vector machine, genetic algorithm, principal component analysis, and more. 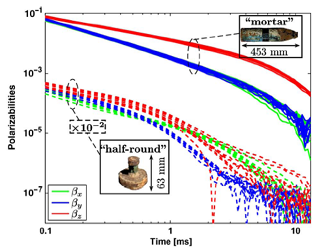 The figure below shows a typical UXO along with its magnetic response, measured and simulated using an ellipsoidal modal approach. The good matching ensures that the model can predict the signature of the UXO accurately, subsequently to be used in a decision making process in the presence of measurement noise and clutter. New generation sensors operate in the time domain in order to avoid disturbance due to the primary field. Such sensors include the TEMTADS (5x5 and 2x2), the MetalMapper, and the MPV family. These multi-axes transmitters/receivers sensors provide a large data diversity from which UXO can be successfully detected, identified, and classified. With its most recent algorithms, Delpsi is able to properly identify up to 5 targets under the MetalMapper and under the TEMTADS using a single data shot. The figure below illustrates typical signatures obtaine from a series of measurements over similar targets, showing good signature overlap and confidence in identification. In addition, Delpsi operates with these sensors in dynamic mode, whereby a sensor is not place atop a suspected target but waved or driven to survey a larger area in a short time. Survey speed is obtained as the expense of data diversity (e.g. less transmitters) and quality (e.g. more noise), location information (lateral, longitudinal, and depth), estimated magnetic polarizabilities, estimated aspect ratio, and detection criterion metric as the MetalMapper is driven along a data acquisition lane. Click on the movie below to see an illustration. Engineering Research and Development Center (ERDC), Vicksburg, MS.